Rich Beeston explains the benefits of using online content marketing to attract more donors – and why fundraising is all about the content! Fundraisers need to be an attention-seeking lot, spending much of their time writing, putting on events, waving their hands around and generally doing whatever it takes to get more eyeballs on their cause. And it can be exhausting, which is why I’m excited about ideas that make donor acquisition easier. It’s also why I’m a believer in the power of content marketing – a strategy that leading nonprofits have been using for years. The good news is it’s cheap, fast and surprisingly effective – for small or big organisations. The way content marketing works is best illustrated using Seth Godin’s famous Purple Cow theory. Godin says that in a field of black, white and brown cows, if a purple cow comes along, it will be remarkable… and people will start talking. And that’s the theory behind content marketing: in a world of generic online articles and blog posts, well-written content that’s engaging, fun, provocative or exciting will stand out and have the power to attract all sorts of attention to your cause. In fact, if you master content marketing, your content has the potential to be the main source of traffic flow to your site, bringing in hundreds or thousands of visitors (that is, potential donors) a day. Let’s look at some real world examples to show you how it works. World Vision Australia has adopted a fairly classic content marketing model that looks like this: first, collect inspiring stories from the field; then turn those stories into compelling blog posts for the website; next, promote the blog posts on social media (with a link back to the site); and lastly sit back as supporters read, like and share the content. In one recent post, World Vision shared the story of Geoffrey, a Ugandan farmer. The short story sat alongside a photo of Geoffrey proudly holding a tray of cakes made from sweet potato – a simple treat that is helping to fight malnutrition. There were no fancy videos or expensive celebrities involved. After only a day or two, the post received 10,000 likes on Facebook, 451 shares and 150 comments. Each of these likes, shares and comments fed into the newsfeeds of other Facebook users, with a potential organic reach of well over 100,000 people. That’s a lot of attention for one little story. And do you think it’s increasing their online donor acquisition? 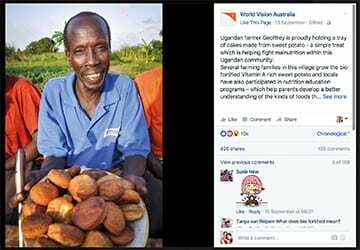 All I can say is that World Vision Australia is posting similar posts almost every single day… and so would I. Just to prove you don’t have to be one of the biggest nonprofits in Australia for content marketing to have an impact, take a look at the Free the Bears Fund. Based in Perth, it is dedicated to protecting, preserving and enriching the lives of bears: particularly aiming to stop abuse, neglect and illegal trading. Following the same basic content marketing formula as World Vision, Free the Bears regularly shares short, provocative stories about the mistreatment of bears. One well-timed post began: If you’ve got the Monday blues and are feeling a bit sorry for yourself, spare a thought for this little fella… It went on to tell a good news story about a two-month-old bear that was rescued thanks to the support of donors (with an engaging photo and a link back to the website, of course). The post generated 822 likes, 84 shares and 30 comments on Facebook, with an estimated organic reach of over 10,000 people. Yep, it works. If you want to make content marketing work for you, then write blog posts that people will read and share… those articles that pop up in your Facebook feed that you just can’t stop yourself from reading. You’re after the kind of content that makes you smile, laugh, cry or sit and ponder for a few minutes. Impact Let people know how your nonprofit is making an impact for good. But instead of using corporate fundraising language, share real stories with real photos. Don’t overdo the emotion, but don’t sound too clinical either. Inside stories An honest, challenging, heartfelt or insightful message written by your CEO is a quick and easy way to show people the heart of your organisation. Praise The truth is supporters never get tired of being thanked or of seeing good news stories about how their support has impacted the world. And, as a bonus, they tend to ‘like’ social media posts that mention the good work being done in their names.Special occasions Write up a quick but genuine message for your supporters on Christmas or Mother’s Day. Post it on your blog and share it on social media. Pop culture Add your thoughts to whatever people are talking about at the time. Are the Olympics on? Write an article about an inspiring Olympian and how their example can give us all courage to follow our dreams. As your share-worthy content is discovered on your website, liked on Facebook, talked about on Twitter and emailed around the world, more and more prospective donors will discover who you are and what you’re about. And as they come to your site to find out more about what you do, encourage them to sign up to your mailing list and start a digital relationship that will lead them on the journey from casual visitors to committed givers. Rich is the founder of Linked Creative, a Sydney-based copywriting and content agency helping nonprofits and charities attract, engage and retain more donors through compelling online content. Visit linkedcreative.com or email [email protected].